The first 470 Class World Championship was organised in July 1970 on Lake Lacanau near Bordeaux (France). Fifty-one boats from fourteen nations and three continents (Europe, North America and Oceania) took part, with the first World Champion title won by the brothers Yves/Hervé Carré from France. Since 1970, the 470 World Championships have been organised annually, except in 1976 at the request of the IYRU. 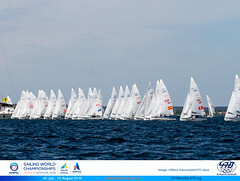 The 2003, 2007 and 2011 World Championships were sailed within the scope of the ISAF Sailing World Championships. 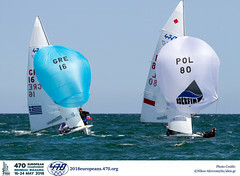 The 470 World Championships were initially open to all sailors, but from 1973 they were restricted to a maximum of eighty boats on the basis of entry quotas per nation linked to the level of 470 activity in each country. After the IYRU decision to split the open 470 Olympic event into two events, the 470 Internationale decided that for 1985 a Women’s 470 World Champion title would be awarded to the first women crew of the World Championship. The first Women’s 470 World Champions were the sisters Karen/Gail Johnson from Canada. With the number of women crews increasing quickly, for 1986 the 470 Internationale decided to hold a Women’s World Cup at the same time and venue as the World Championship, which remained open to men and women. The women could choose to either sail in the Women’s World Cup restricted to women crews, without any title awarded to avoid any confusion with the IYRU Women’s World Championship, or to sail in the 470 World Championship where men, mixed and women crews were allowed to compete. In 1987, the Women’s World Cup officially became the Women’s World Championship. Women were still allowed to take part in the World Championship which remained open to all categories, but all chose to compete in the Women’s World Championship. From 1988 to 2002, two 470 World Championships were organised each year, one for men and mixed crews and one for women crews. 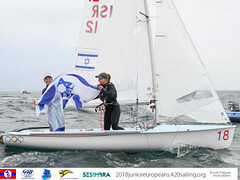 The 470 Women’s World Championship had no quota limits, whereas the 470 World Championship for men and mixed crews was still restricted to a maximum of eighty boats until 1992. This restriction was abandoned in 1993 for the 30th anniversary of the 470 Class, which was celebrated during the 470 World Championships held in Crozon Morgat (West Brittany in France) and was applied again once in 1998 in El Arenal (Spain) at the organisers request. The application of the regatta format of the International Spring Cup, which had consisted since its creation in 1976 of a qualifying and a final phase by fleet, made it possible to abandon the restrictions to participation. From 2003 onwards, the 470 Internationale has not allowed mixed crews to compete in the World Championships. Many nations have achieved great success in the 470 World Championships. However, Germany (with former Federal Republic of Germany and former German Democratic Republic) has been the most successful nation by securing twenty-four medals (nine gold, six silver, nine bronze), followed by the Netherlands with seventeen medals, (nine gold, four silver, four bronze), Spain with seventeen medals (seven gold, four silver, six bronze), Australia with thirteen medals (seven gold, four silver, two bronze) and France with thirty-one medals (five gold, sixteen silver, ten bronze). The Greek women’s crew Sofia Bekatorou/Emilia Tsoulfa won four consecutive World Champion titles from 2000 to 2003. The Dutch sailor Lobke Berkhout won five World Champion titles in 2005, 2006, 2007, 2009 and 2010 with two different crew members. All-time great is the Australian sailor Malcolm Page who has won six World Champion titles in 2004, 2005, 2007, 2010, 2011 and 2012 with two different crew members. The French Philippe/Hubert Follenfant (France) won four silver medals in the early ‘70s, but were never World Champions.